These yummy Little Smokies are a fantastic appetizer to serve at your next party! 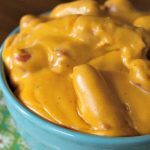 I recently brought two different slow cookers full of these Cheesy Little Smokies as well as a more Classic Crock-Pot Little Smokies to a church potluck and they were both a big hit with everyone. 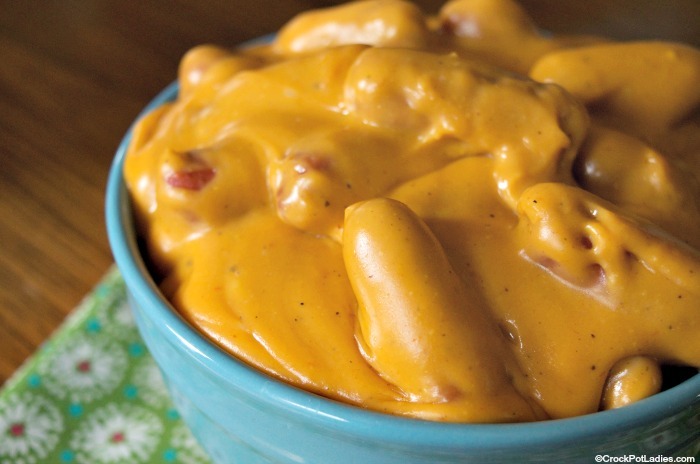 This cheesy version is super delicious warm and gooey. I personally used Velveeta cheese because to be honest I LIKE Velveeta. But I totally get that not everyone is a fan. If you are Velveeta adverse you can use a good quality Gouda cheese instead. Gouda cheese melts nicely without getting oily and greasy as long as you don’t over cook it. The addition of barbecue sauce adds some great smoky-sweet flavor that compliments the mini cocktail sausages and the cheese. 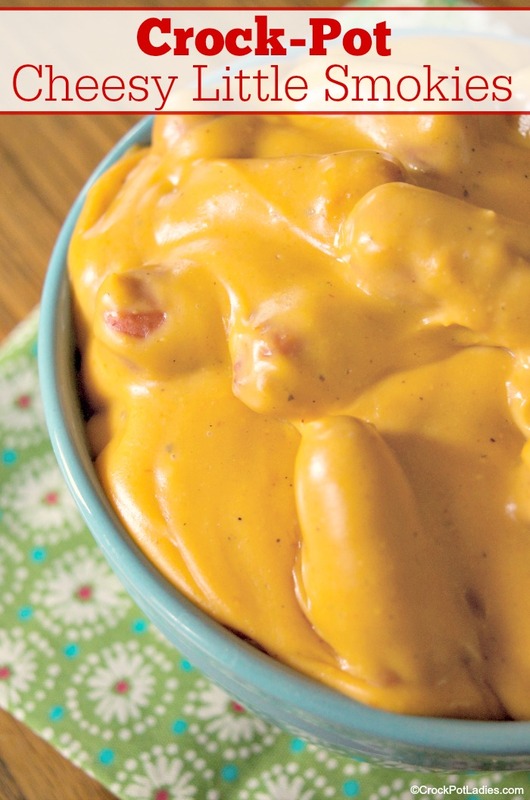 Outside of church potlucks these cheesy little sausages would be great served as a Game Day appetizer or at a causal birthday party or family get-together. With just three ingredients these little smokies are dripping with cheese and are the perfect party or game day appetizer! Open the packages of Little Smokies sausages and drain off any excess liquid that may be in the package. Add the drained Little Smokies to a 5 quart or larger slow cooker. Cut the American cheese (or Gouda if using) into 1 inch chunks and scatter the chunks over the top of the sausages in the slow cooker. Evenly pour the bottled barbecue sauce over the cheese and sausages. Stir to mix a bit, and then cover and cook on LOW for 2 hours stirring every 30 minutes to ensure the cheese is melting evenly. Turn slow cooker to the WARM setting and set out cocktail toothpicks to allow your guests to easily serve themselves straight from the slow cooker. To make clean up easier you may wish to either line your slow cooker with a slow cooker liner or spray with non-stick cooking spray. I don’t even know where the 3 and the 6 came from Robyn. The recipe should read 28 ounces Little Smokies (I have edited it). Thanks for letting us know!